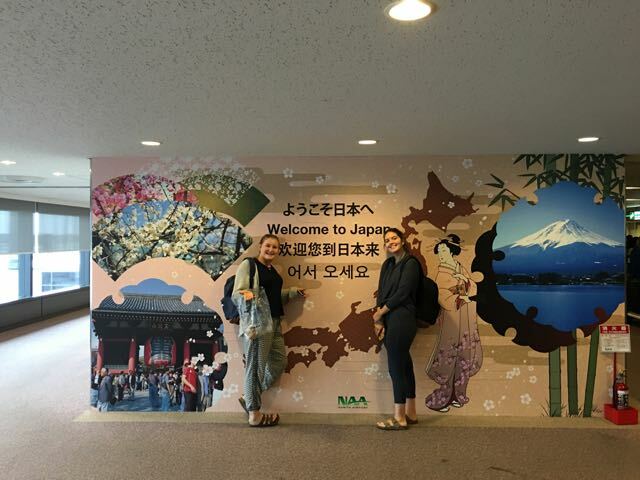 Our flight to Tokyo was, thankfully, uneventful…aside, of course from the early morning wake up call and jaunt to the airport (3:45 AM!). We landed in Narita (a very quiet airport…really, very little noise even with hundreds of people around. We made it quickly through immigration and caught the Keisei Limited Express to Asakusa. I have stayed in a few places in Tokyo and I really like Asakusa. Historically, this area was an entertainment district during the Tokugawa Shogunate and remains a center of attraction for Japanese folks to this day. Literally thousands of people crammed the streets. We arrived during a political rally as the streets near our hotel were all blocked off for the speeches of candidates. They stood on a bus with a platform on top….they traveled around the city on this bus and spoke from loudspeakers to a huge crowd. After making our way through this dense mass of humanity, we headed through the grounds of Senso-ji temple past vendors in stalls leading into the temple proper. 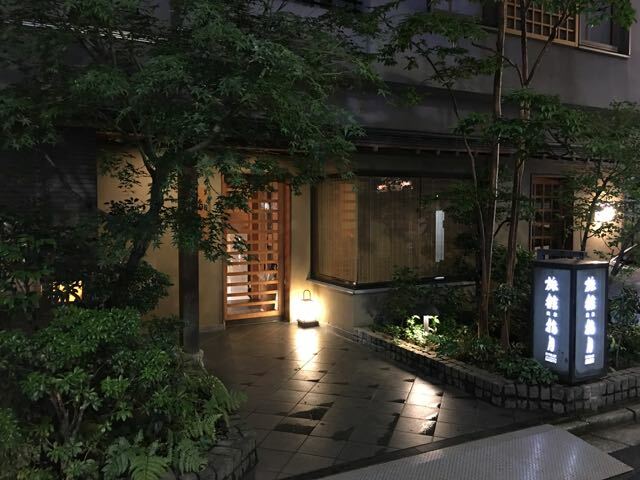 We wandered, a bit, trying to find this small, traditional Japanese hotel…or Ryokan. I had the street address, but the problem is that once off the main thoroughfares, all signs are in Japanese….I know a fare bit of Kanji, and these signs were all written in traditional script. Well, hmmm. So, we turned to Apple Maps. I keyed in the address and it popped up the hotel and location with walking distance and a direction arrow….EXACTLY what I needed! Back to the story: We found the spot about 300 feet down a very small street. The place could not be any nicer and centrally located….steps away from the vendors and the temple. Our check in was seamless. If you travel to any part of Asia and are looking for a way to expedite your travels and book rooms, www.agoda.com is really a great booking web site. Every time I have used them I have had no difficulties at all. You get a receipt to present to the hotel with the details of your stay. It works exactly as you imagine it would…no issues. 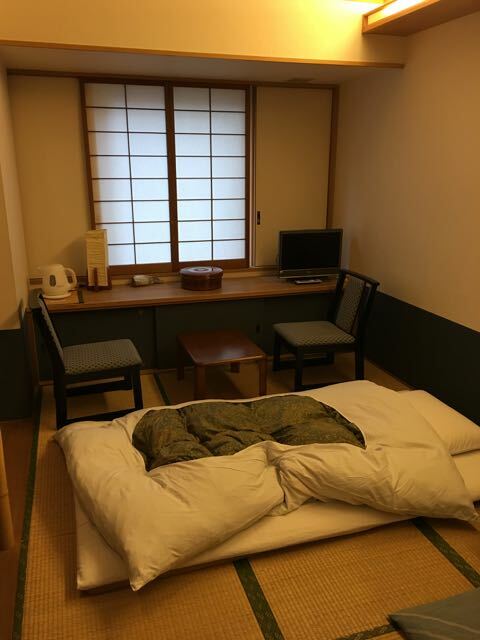 The small room…tatami mat and all! speak about the room and whether or not they enjoyed it! As you will see in the photos, the rooms are small, with a futon on a tatami (rice) mat. The futon leaves a lot to be desired; those used to sleeping on pads in a tent will have no problem. Those looking for more plush surroundings should look elsewhere. 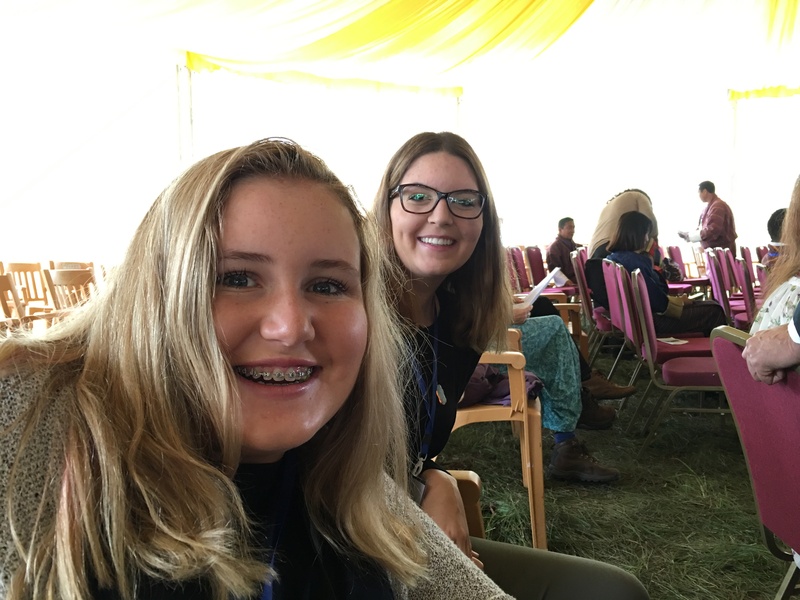 The hotel and rooms are very quiet, even though they are packed into a very small space….Halle and Natascha are next to me (302 and 303) and I cannot hear them at all. On the top floor, the hotel includes a hot bath for guests….the small space is really wonderful and includes a room that looks exactly like an onsen. Halle and Natascha enjoyed a first night in the tub together. More details in the next post. 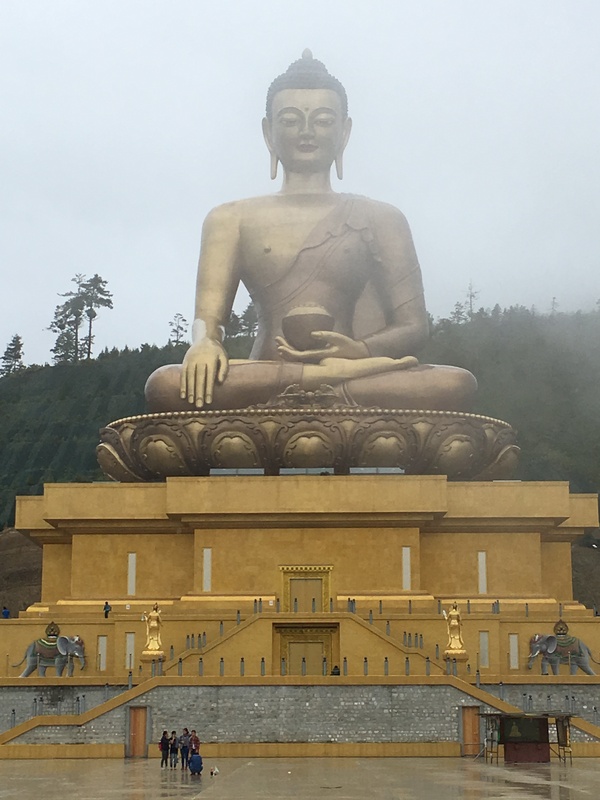 Despite the various difficulties getting here, Bhutan was, as always, wonderful. 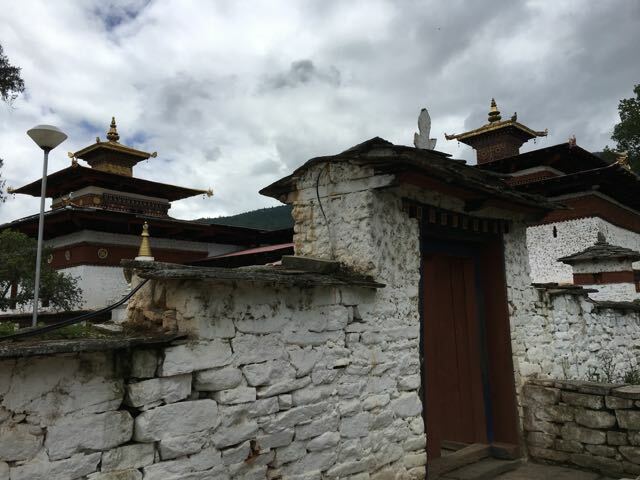 Today, our travel from Haa to Paro took about 2:30 hours and we headed to lunch in town and then on to Kyechu Lhakhang Temple. For years I wanted to visit the temple dedicated to Dilgo Khentsye Rinpoche and visit his home and grounds. The temple did not disappoint. The original building was constructed in the 7th century and is dedicated to Avalokitshevara, the bodhisattva of compassion. The two shrine rooms include a few ancient statues and a monk obliged our request to open the inner sanctum and view the original Buddha statue and the surrounding bodhisattvas. I so wish I could share a photo, but, as you can imagine, that practice is strictly forbidden. The room is small and filled with statues of a number of bodhisattvas. The largest are life size and the smallest sit on shelves around the room. I’m guessing we were in a space no more than 12×12 feet square. Halle and Natascha had their prayer beads blessed and we departed for the other shrine room (the main shrine room). In this space is a statue of Dilgo Khentsye Rinpoche himself. Halle’s comment “Dad, he was so cute” pretty much captures his essence, I’d say. He was, by all accounts, a very learned, loving, humorous, caring person.We slowly made our way around the grounds of the temple, spinning prayer wheels, Namgay talking about the history and significance of this place. Our evening was spent strolling around Paro town, visiting with Namgay’s nieces and his partner Debbie. We are on to Bangkok tomorrow and Tokyo the next day. Our stay in Tokyo at a traditional Ryokan promises to be fascinating…and hopefully, interesting! 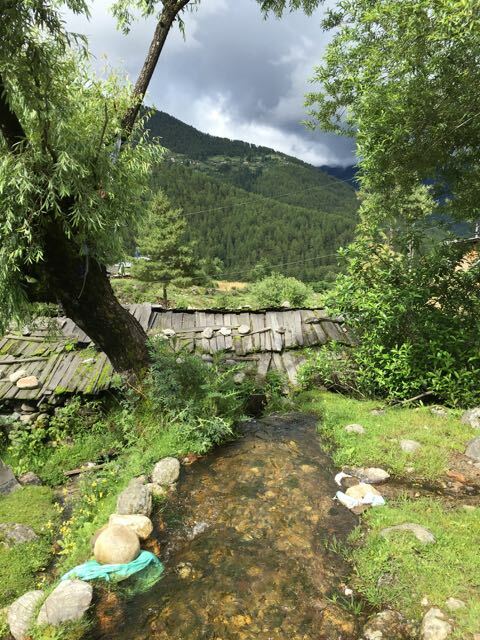 Many valleys in Bhutan are remote, taking hours of travel to reach. In some cases, you travel through small villages and communities filled with cows, dogs, and the occassional horse. On this day, we took the road from Thimphu south toward the Indian border and then turn off toward the Haa valley. In the world, there is remote and then there is REMOTE…the Haa Valley is situated in the folds of the mountains in a small valley with a river running through the center of the valley and town. One goal for today was to see the Haa Festival. We arrived just in time to sample the local food including one of the tastiest foods I have ever had in Bhutan, buckwheat and spinach mo-mos. These small delicacies are served just twice a year and we were lucky enough to have them on this day. The festival included dancing, music, archery, and spear throwing as well as booths on local health, botany, farming, history, and art. 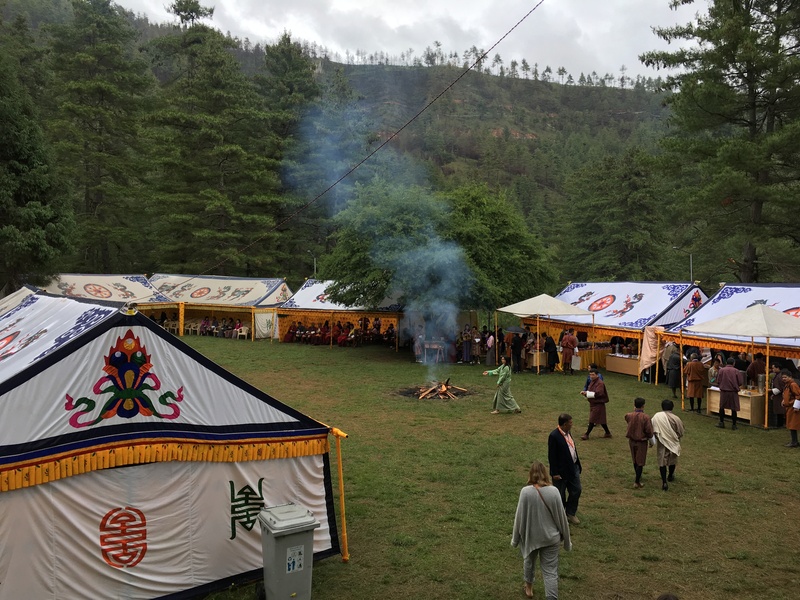 As we wandered around the grounds, most of the festival goers were waiting for the evening activities….as rain descended on the valley, we wondered if those events would happen! Diversion channel headed to the mill. After the festival we headed west up the valley to just a few kilometers from the Indian border to a village called Hatey (or Champa….a couple of people argued about the name). 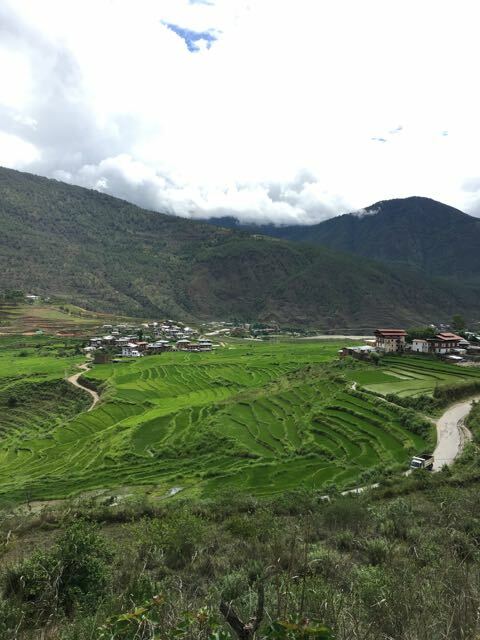 Namgay found a farm house (Soednam Zingkha) situated along a stream in this farming community. The house was owned by a family whose matriarch was known as Zingkha Mii-aum, or mother of the village. The house gots its name Soednam (jewel of luck) on the surface of a pond (zingkha) because the location was considered auspicious between a running stream and pond. Just across the stream from the house is a working wheat grinding mill, centuries old. We found a woman grinding wheat into flour to be used in the regional dish tsampa. 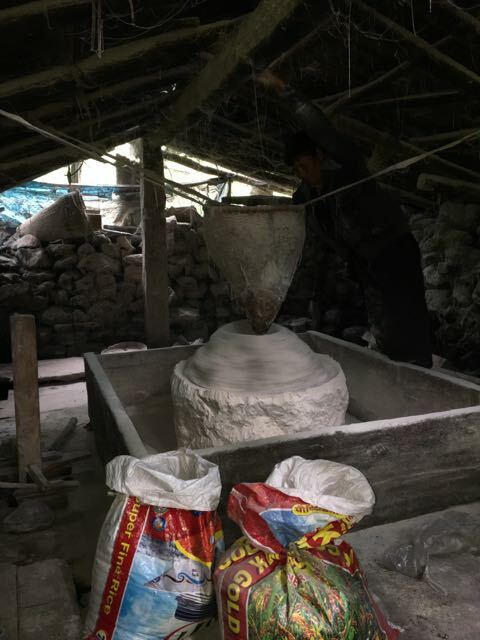 Her work was in a this small, dark building and she managed the grinding wheels as she poured wheat into a basket just above the grinding stone. 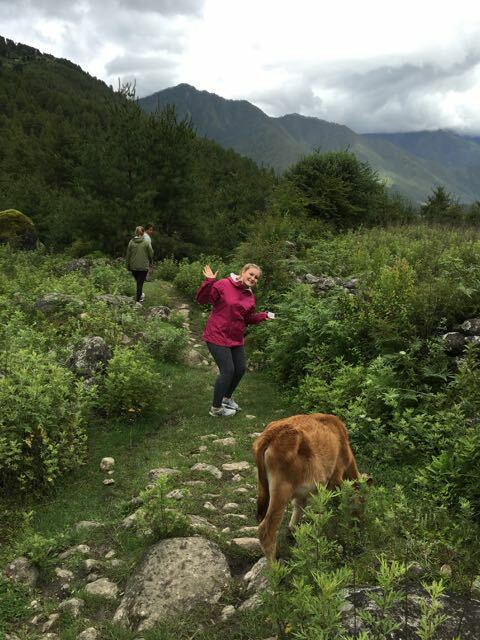 In the afternoon, we hiked down a farm trail / animal trail near the stream and into another village just below. We found farmers using cows to plow a field, children playing soccer, and folks hanging wheat in the rafters of their houses for winter. Grinding the wheat into tsampa. This place is so worth the visit and stay; I will definitely bring students to this village in the future. It is, truly, a lifetime away from the rest of the world. 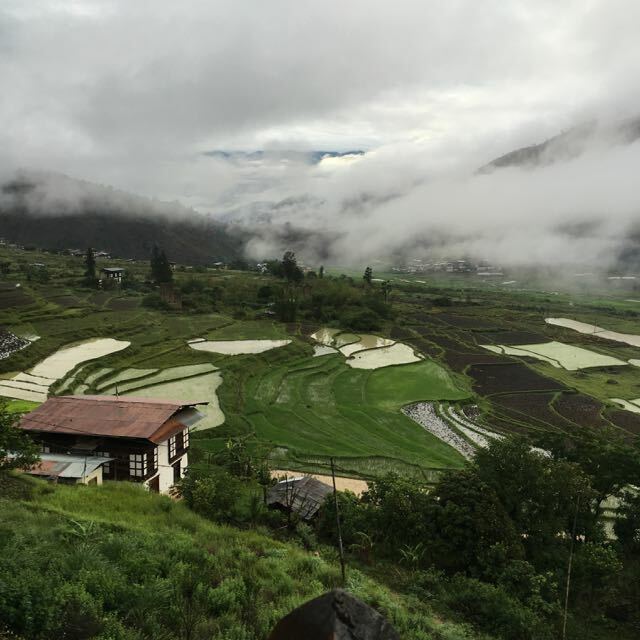 Our day began with early morning photos of the Punakha valley…waking at 5:00AM, looking out to a fog-filled valley was quite wonderful. 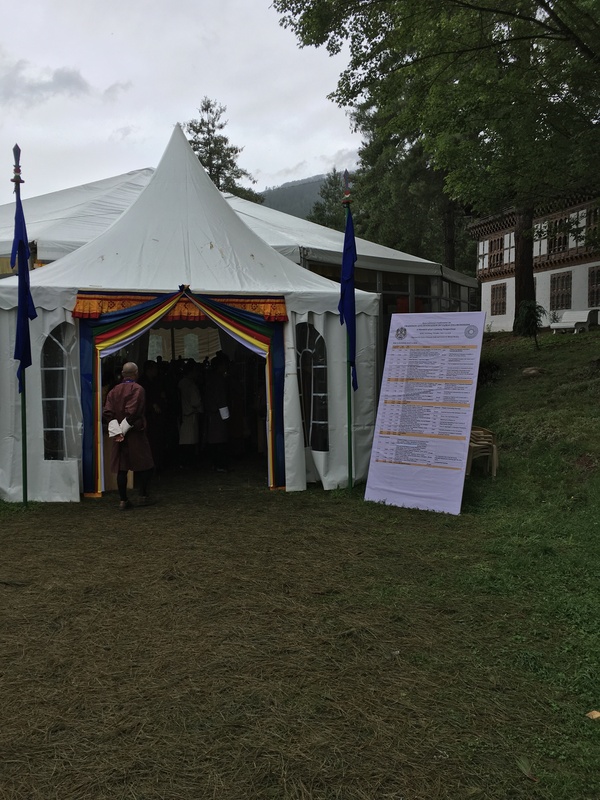 We headed back toward Thimphu and made a side trip to a nunnery, Sangchen Dorji Lhundrup Choling College. When we arrived the nuns were learning grammar by singing the various rules of grammar out loud. Each nun was situated in her own spot around the campus, and each was singing a section of the grammar book. Maybe that is a great way to actually learn grammar! Who knew? The thing that makes this nunnery interesting is the shrine room with a huge sculpture of Avalokitshevara, the Bodhisattva of Compassion. The sculpture shows the bodhisattva with 11 heads, 1000 arms and 1000 eyes. As the story goes, the eyes and arms are for searching for people who have fallen into hell because of their various deeds and pulling them out of hell back into the world. The eleven heads are said to come from the fact that because so many people fall into hell, the bodhisattva needed more to be able to find all of the beings thrown into the lower realms because of their deeds and karma. 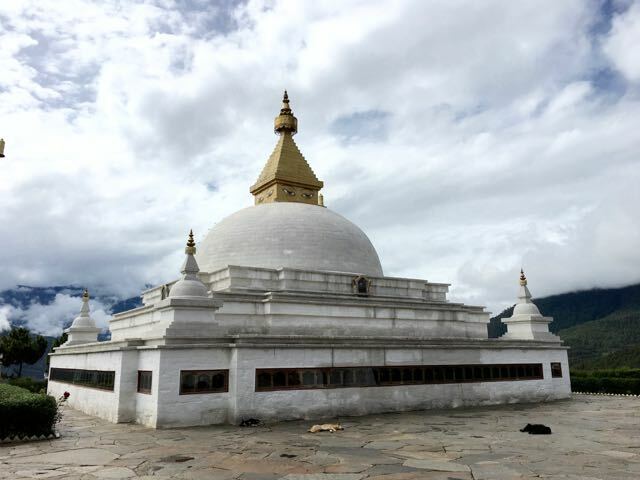 In addition, the grounds of the campus include a reconstruction and replica of the great stupa in Nepal, Boudhanath. 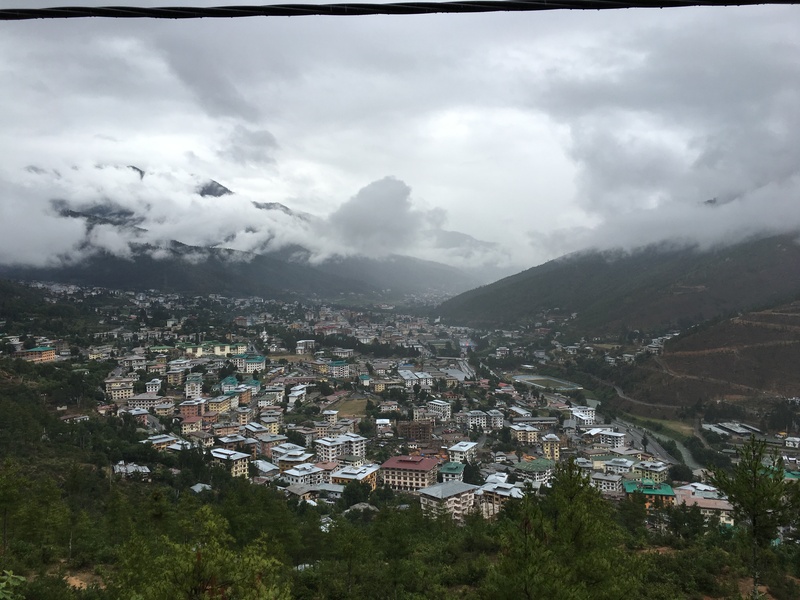 The nunnery sits atop a hill overlooking the Punakha Chu river and can be seen for miles around the valley….in fact, you can see the stupa on the road from Thimphu to Punakha (if the clouds cooperate). We had the chance to talk to a nun working on her art class. She was replicating the various graphic styles used to decorate the walls of the shrine room as well as practice freehand drawing the lotus flowers. She spends about two hours each day just learning about drawing and painting. Very cool. Our ride back to Thimphu was as bouncy as before (maybe a little less muddy!) and we made it back to Thimphu. Halle and Natascha wandered around the town in the afternoon. In the evening, we went to Cloud 9 Gourmet Burger and Milk Bar, a really wonderful bakery, restaurant, and coffee bar. The food is exceptional and the veggie burger I had (hand made in the restaurant) was excellent. Natascha and Halle had BURGERS of all things (!) and said they were great. I do think, however, the French Fries were the highlight of this visit with red chili dipping sauce. We are headed to the Haa Valley and the Haa Valley festival today. We are checking out a local farm house converted to accommodate small groups. This spot could be a great spot to stay on a future trip. 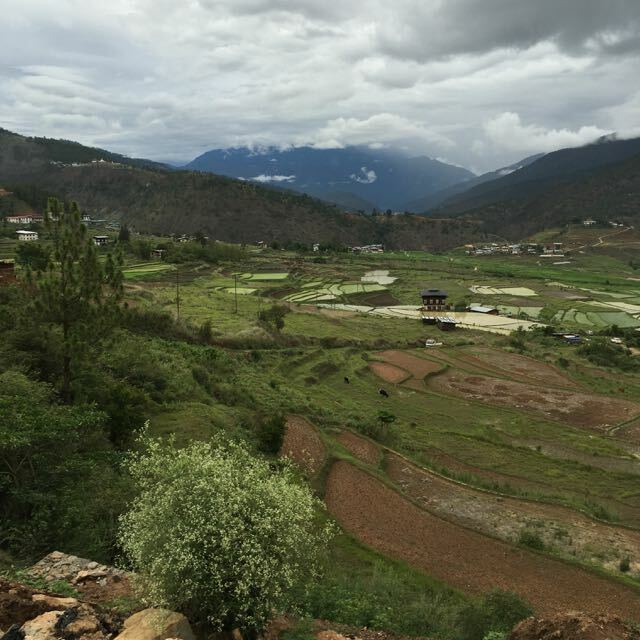 The trip from Thimphu to Punakha is relatively short, as Bhutan travel goes. The trip up over the pass and down into the Punakha Valley winds around the sides of the mountains and you rise from one valley floor to another. The road between these two places is under construction and sections of the new pavement are a joy to behold and ride on. Other sections, still being shaped by Indian workers, are fascinating. The rain storm the night before made sections of this road impassible to all but the most intrepid of travelers. The ruts carved into the surface of this semi-liquid mass were ever changing as car, truck, motorcycle and mountain bike toiled up, down, and around these trails. The normally brief two hour journey took us a bit longer. So, in light of the muddy roads and the traffic we did what sounded right: we stopped. We stopped for tea, we stopped for photos, we stopped just to look around. 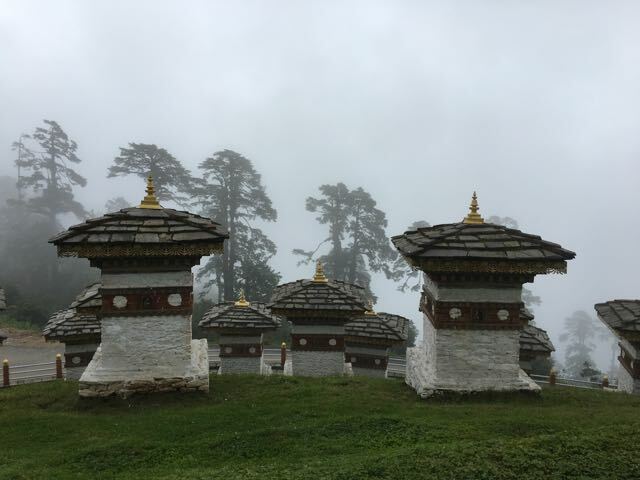 We made a great day out of the experience and saw pieces of Bhutan that one might normally pass by on the way to somewhere. Our photo stops were particularly remarkable. 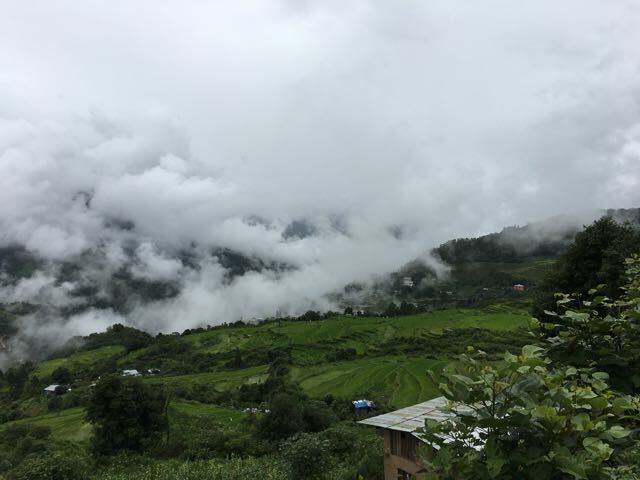 The clouds hung over the mountains and occasionally revealed hidden houses and villages. We snapped shots as the clouds parted and found some of the most ethereal places I have ever seen. The rain has made the rice fields bright green, almost fluorescent, as the color just seems to leap up from the plants. Hopefully, you will see in some of our pictures the beauty of those fields. By the time we reached the small town of Lobesa, we were ready for a rest from the turmoil of the well-traveled road. The small village of Lobesa is really just a brief stop on the way to either Punakha Dzong or Wangdue Phodrang and parts east. Everything in the village is a few feet from the side of the road. 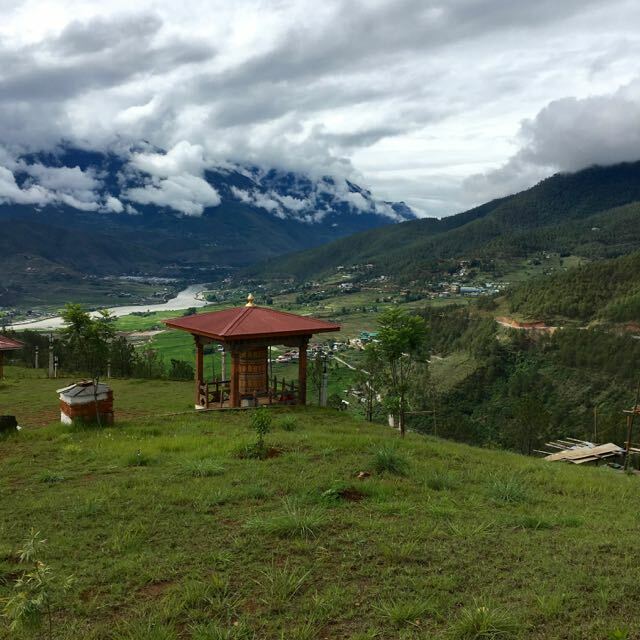 The Hotel Lobesa sits on a steep hill overlooking the Punakha Valley, the Punakha Chu River and is owned by the Panang family. These folks cater to you in a way that is unexpected. They are kind, generous, open hearted people who make you feel welcome and cared for. 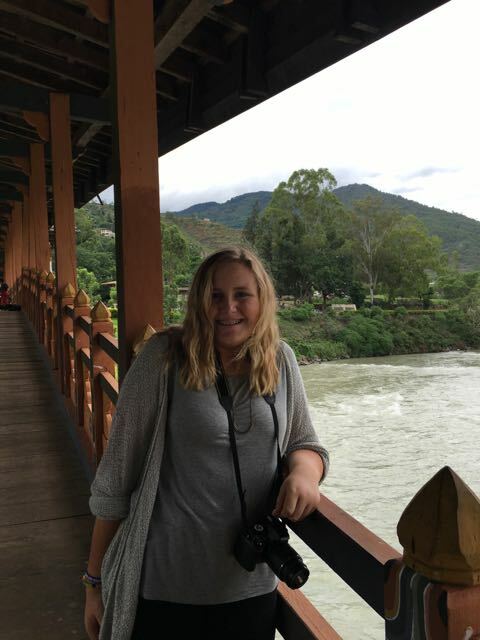 We were given the best rooms in this hotel (of about 10 rooms) overlooking the Punakha valley with unobstructed views of the temple of the Divine Madman. As we eat our meal and I surprised that we were served okra. Growing up in Georgia, okra is a summer staple and as a child I ate my fair share of this vegetable. The thing is, every time I have eaten okra, I feel a kind of slimy texture. That’s what signaled me that this vegetable was, indeed, okra. 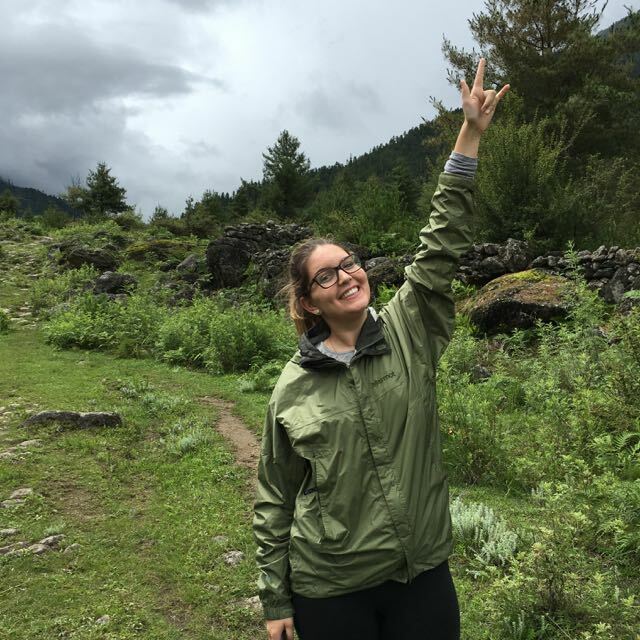 So, I asked, the staff, “what do you call this vegetable?” thinking that I had just uncovered some incredible secret that connected my childhood home to Bhutan. The young girl said, “Okra.” OK. Let’s chalk that one up to my idiocy and move on, shall we? Our afternoon was spent at the Punakha Dzong. In the past, I have visited this place and have spent a short time walking the grounds and seeing the shrine room. On this day, we had the leisure to explore. Our guide, Namgay, is a wonderful story-teller and he relayed this story to us about the dzong and the strength of the Bhutanese people. 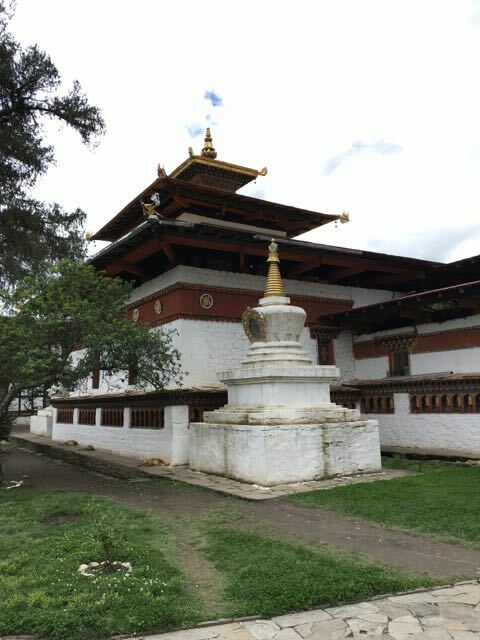 According to scholars, the dzong was built in the 1600s. 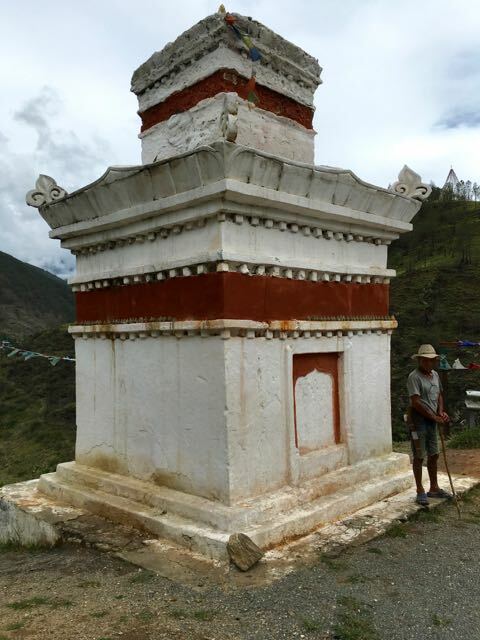 The fortress was a means of protecting western Bhutan from Tibetan armies descending from the north. This valley leads to Tibet, and the rich farmland of Bhutan was attractive to Tibetan leaders. 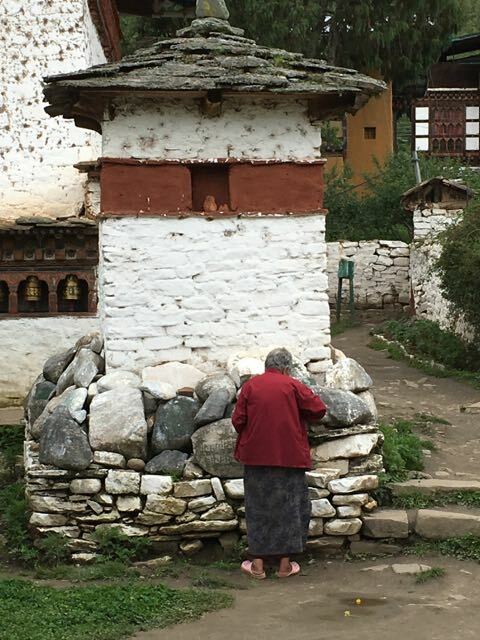 Once the dzong was completed, in the late 1600s, a Tibetan army of about 2000 marched down the valley to raid the farms and villages of Bhutan and steal recently harvested crops. As the legend says, the Bhutanese army of only about 200 soldiers was no match for this well-armed division. As a means of fooling the Tibetans into thinking there were many more Bhutanese defenders, the Bhutanese general had his troops march, repeatedly around the dzong. The Tibetans, watching from across the river, counted the numbers of troops and decided that a direct assault would be a disaster. As the story goes, they returned to Tibet fearing that a full-scale conflict here would be a disaster. The massive scale of the structure extends from the exterior walls to the stair cases, doors, interior buildings and shrine room. 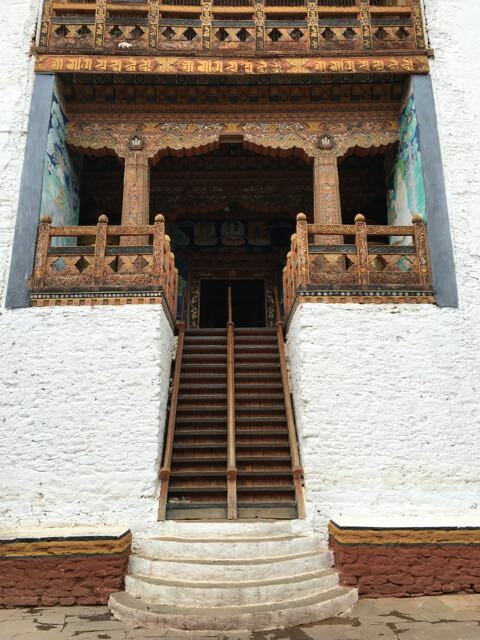 The climb into the dzong heads up a staircase not for the faint of heart. The incline is steep and you hold onto a handrail as you ascend the staircase to the guard station. Passing two giant prayer wheels, you pass through a doorway about 18 feet tall and wide. The door itself, constructed of wood, is about 16 inches thick and clad in metal studs. Once through the doorway, you enter a courtyard. In the center is a live replica of the Bodhi tree, which, according to Buddhist legend, was where, in India, the Buddha achieved enlightenment. 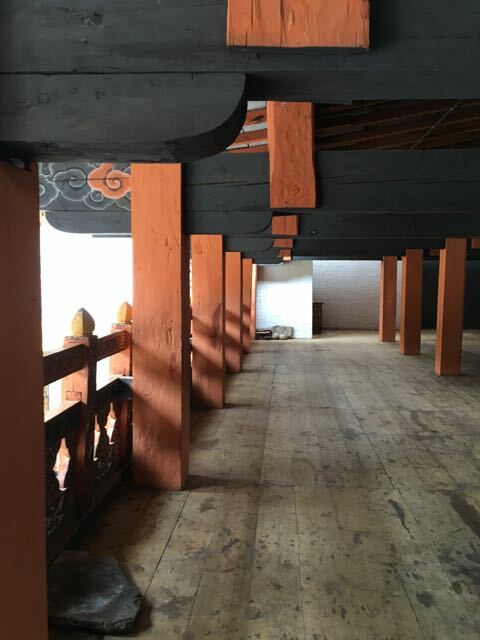 Check out the photos as we upload them of the Dzong….more details to come. 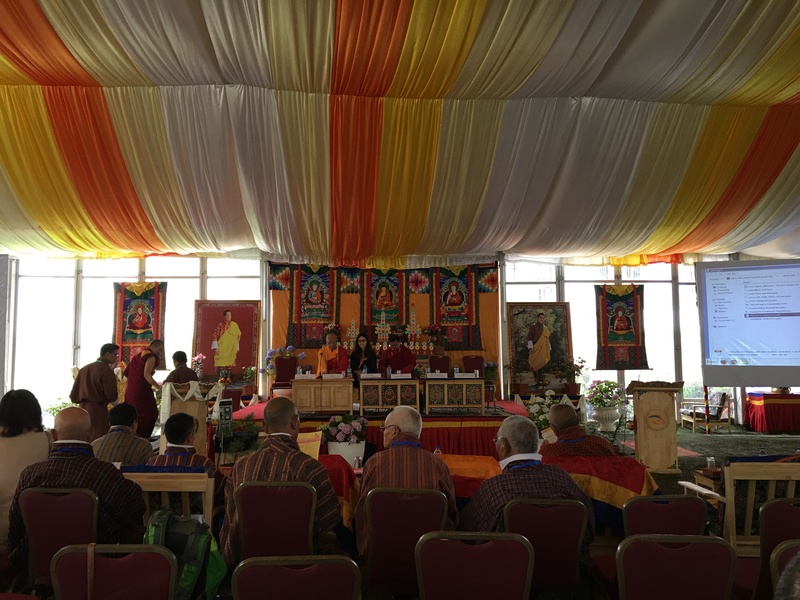 Photos of Thimphu, the Conference Site, and Etc. Ready for a day of talks!